Palin has been the target of tough leaks from some former McCain staffers. (CNN) - The war of words between supporters of each half of the Republican presidential ticket escalated Thursday, as a spokeswoman for Sarah Palin called charges circulated by former campaign aides to John McCain ‘sickening,’ and the Alaska governor herself said the advisers spreading the rumors were ‘small, evidently bitter’ people. Former McCain campaign aides have been sources for a string of embarrassing stories about Palin that have become public since GOP defeat Tuesday night, including the charge that she spent thousands of dollars more on clothing for herself and her family than the $150,000 that has been reported. There have also been reports of a somewhat distant relationship between John McCain and his running mate. “This is so unfortunate and, quite honestly, sickening,” said Palin aide Meghan Stapleton in a statement. “The accusations we are hearing and reading are not true and since we deny all these anonymous allegations, there is nothing specific to which we will respond. 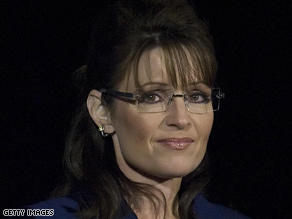 Back home in Alaska, Palin herself said she would not respond to individual accusations. So the two can't get along? That should have been predicted! After all, they're supposed to be "mavricks"–a term that describes wayward cattle that stand alone, far from the herd. "Mavricks" are neither leaders or followers–and certainly not uniters. Rather, they each stand alone, with no regard for each other or the herd–convinced that their way is the only right way–and without regard for where the rest of the herd is going. Hello patrik, just in a few words, i guess you should encourage Palin and any other political figure to learn from the mistakes she made in this election.You do not disrespect others and expect to be respected.Leaders speak to all constituencies and not limited to likely constituency that is why President elect B.Obama had this "obama tsunami effect" over Mccain. well there are many lessons to learn from this election Patrick and one of them is what we are doing now, talking as one people over our disagreements and not being condesending and i which to share with you all the bigger lesson i coiuld amke from this election. I believe in the United States of America as a government of the people, by the people, for the people; whose just powers are derived from the consent of the governed; a democracy in a republic; a sovereign Nation of many sovereign States; a perfect union, one and inseparable; established upon the principles of freedom, equality, justice, and humanity for which American patriots sacrificed their lives and fortunes. I therefore believe it is my duty to my country to love it, to support its Constitution, to obey its laws, to respect its flag, and to defend it against all enemies.”(William Tyler, 1971). Hence the 2008 election was a historic one but above all it spoke of the power of the American values, and principles of democracy. The election of a black man made me see democracy as a choice of truth, as articulated to a great majority and reflected by the people through vote in acceptance or denial of the course you lead. The people of America choose pragmatism against ideology, unity against divide, HATE(racism). We as a prople have risen against the tides of temptation and together we said Yes we can and today we do say YES WE DID. I'm sorry, but Palin is not a strong woman. When it came to looking for a strong leader, she was (is) an idiot. I have no problem voting for strong women – I have done it many times, for many different offices. I have worked for women that I greatly respected. But I expect a minimum level of intelligence and ability in women as well as men. Palin, however, did not have the experience Obama had. Obama had built up more experience just running his campaign than Palin did in all her years as Mayor of Wasilla (especially since someone else had to be brought in to handle the day to day administrative tasks) or her 18 months as Governor. But it isn't EXPERIENCE that was the problem. It was the absence of sound judgement and nation political knowledge. Palin was severely lacking in both. I have no doubt that she is a good mother, that she cares and means well, but her actions during the campaign – especially her lies and divisive calls to supporters that led to rising hate speech and calls for violence from those same supporters – means that she has not earned, nor does she deserve, my respect. Her comments since the election have been cordial and conciliatory, but it is too little, too late. The best thing she could do for herself, her party and her country is to return to Alaska and never return to national politics. McCain Aides...you all chose her as the running mate. Who's the bigger idiot? The idiot who gets chosen or the idiots who chooses the idiot? I think it's the latter. McCain lost because of your incompetence. He's a hero and you all turned him into a fear-mongering, Obama bashing, machine. His concession speech was very sincere. Good luck to McCain. As for his aides, quit playing the blame game. The election is over and the smart party won. I am very glad that Palin got what she deserved. She was spewing lies, smears, and hate the entire time she was running for VP. How such a hateful, manipulative, and deceitful woman as Palin can call herself a ‘Christian? She ignited hate and intolerance in people. When McCain/Palin campaign will explain the illegal use of the RNC/tax payers’ money (thousands of dollars in addition to $150,000 that the campaign paid for Sara Palin’s extravagant personal things? What about $22,800 for 2 weeks paid to Palin's traveling stylist, Amy Strozzi, who is a celebrity makeup artist? This ‘pit bull with lipstick’ has probably confused a political campaign with a beauty pageant. $22,800 for 2 weeks for Palin’s makeup?! A lot of families in this country make $22,800 or less per year! Yes, Sarah Palin is an anti-intellectual person (simply, stupid) but she is also arrogant, deceitful, and greedy. As one of the comments said: What a pathetic excuse for a mother and a human being! I feel sorry for her [Palin’s] children who have a lying, ignorant, backward mother. I voted for Obama. That said I had great admiration for McCain in the past. However his choice for VP honestly makes me wonder about his mental condition. Early dementia, perhaps? Seriously!! However, it's not that surprising when you see his trophy wife "Bimbette Barbie. Speaking of wardrobe, didn't she spend as much on her outfit for the convention as Palin did for the entire campaign. I wonder if those outfits will be donated? Let's just be grateful that neither The Maverick or The Moose Hunter will not be governing our country. Palin is politically uneducated, hate spewing and God help us if she elects herself to the Senate. I don't think that she has a long-term political future. I think that she is now damaged goods and it's because of her own actions ( who cares how many towels she did or did not have on). What's scary is the damage she's still in a position to do to Alaska and the fact that some people actually voted for her to be a heartbeat away from the presidency. She reminds me of a woman who had a chance to rise in a company and then it was discovered that she had been promoted in the past because she was sleeping with her married boss. Not much of a chance left, Sarah. You simply should have said thank you, but I do not feel that I am qualified to accept your offer. BTW, if you can't manage your family, what makes you think that you're qualified to manage the United States? Please, please, please nominate this woman in 2012. You are guaranteed to win. John McCain is in pain. John McCain does not like Spain. Sara Palin is vain. Sara Palin sells planes. These two republicains have nothing to gain and are mundane. They will not win Maine. On election day, I hope it rains trains on John McCain and Sara Pain. Pretty sure that horse is dead.